In February 2019, this chapter was revised to reflect updated guidance on Assessment in Working Together to Safeguard Children. Section 4, Communication was also updated to include reference to parents with learning disabilities. Note: Specific issues relating to concerns about unborn children are dealt with in the Localised Content for Dudley section of the West Midlands Safeguarding Procedures. A Child in Need is defined under the Children Act 1989 as a child who is unlikely to achieve or maintain a satisfactory level of health or development, or their health and development will be significantly impaired, without the provision of services; or a child who is disabled. In these cases, assessments by a social worker are carried out under Section 17 of the Children Act 1989. Children in Need may be assessed under Section 17 of the Children Act 1989 in relation to their Special Educational Needs or disabilities, or as a carer, or because they have committed a crime. The process for assessment should also be used for children whose parents are in prison and for unaccompanied migrant children and child victims of modern slavery. When assessing Children in Need and providing services, specialist assessments may be required and, where possible, should be coordinated so that the child and family experience a coherent process and a single plan of action. The need to assess can also include pre-birth situations when a mother's own circumstances would give cause for concern for the future welfare of the child (see Section 11.1, Pre-birth 'Good Practice Steps'). The date of the commencement of the assessment will be recorded on CCM. If it is determined that a child should not be seen as part of the assessment, or should not be seen alone, this should be recorded by the manager with reasons. If, during the course of the assessment, it is discovered that a school age child is not attending an educational establishment, the social worker should contact the local education service to establish a reason for this. NOTE: Where the parents have learning disabilities, it may be necessary to adapt communications to meet their needs – for further information, see Good Practice Guidance on Working with Parents with a Learning Disability (2007) updated 2016. Planning should identify the different elements of the assessment including who should be involved. Where a number of family members and agencies are likely to play a part in the process it is good practice to hold a planning meeting to clarify roles, timescales and services to be provided during the assessment. Assessment should be a dynamic process which analyses and responds to the changing nature and level of need and/or risk faced by the child from within and outside their family. A good assessment will monitor and record the impact of any services delivered to the child and family and review the help being delivered. Whilst services may be delivered to a parent or carer, the assessment should be focused on the needs of the child and on the impact any services are having on the child. Research has demonstrated that taking a systematic approach to assessments using a conceptual model is the best way to deliver a comprehensive analysis. A good assessment is one which investigates the three domains set out in the Assessment Framework Triangle. The assessment will involve drawing together and analysing available information from a range of sources. Where an Early Help Assessment has already been completed this information should be used to inform the assessment. The child and family's history should be understood. The social worker should analyse all the information gathered from the enquiry stage of the assessment to decide the nature and level of the child's needs and the level of risk, if any, they may be facing. Social workers should have access to high quality supervision from a (Team Manager) who will help challenge their assumptions as part of this process. Critical reflection through supervision should strengthen the analysis in each assessment. An informed decision should be taken on the nature of any action required and which services should be provided. 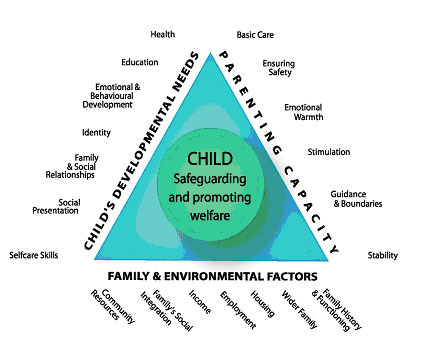 Social workers, their managers and other professionals should be mindful of the requirement to understand the level of need and risk in a family from the child's perspective and ensure action or commission services which will have maximum positive impact on the child's life. Where there is a conflict of interest, decisions should be made in the child's best interests, be rooted in child development, be age-appropriate, and be informed by evidence. When new information comes to light, or circumstances change the child's needs, any previous conclusions should be updated and critically reviewed to ensure that the child is not overlooked (as noted in many lessons from serious case and practice reviews). The child should participate and contribute directly to the assessment process based upon their age, understanding and identity. They should be seen and spoken to alone within the first 5 days of the assessment. If this is not possible or in their best interests, the reason should be recorded. The social worker should work directly with the child in order to understand their views and wishes, including the way in which they behave both with their care givers and in other settings. Every assessment should be child centred. Where there is a conflict between the needs of the child and their parents/carers, decisions should be made in the child's best interests. The parents' involvement in the assessment will be central to its success and they should be involved at the earliest opportunity unless to do so would prejudice the safety of the child. At the outset they need to understand how they can contribute to the process and what needs to change in order to improve the outcomes for the child. The assessment process must be open and transparent with the parents. However, the process should also challenge parents' statements and behaviour where there are inconsistencies, questions or obstacles to progress, and the social worker must ensure that the welfare of the child is not overshadowed by parental needs. There may be exceptions to their involvement, for example in cases of Sexual Abuse or Domestic Violence and Abuse, where the plan for the assessment must consider the safety of an adult as well as that of the child. All agencies and professionals involved with the child and family have a responsibility to contribute to the assessment process. This might take the form of providing information in a timely manner and direct or joint work. Differences of opinion between professionals should be resolved speedily but where this is not possible, the local arrangements for Resolving Professional Disagreements should be implemented (see Resolution and Escalation Protocol). It is possible that professionals have different experiences of the child and family and understanding these differences will actively contribute to the understanding of the child's needs. The possible outcomes of the assessment should be decided on by the social worker and their team manager, who should agree a plan of action setting out the services to be delivered how and by whom in discussion with the child and family and the professionals involved. Assessments will be allocated with a clear timeframe direction: either 15 days or 40 days, depending on the perceived complexity. This is to ensure that all assessments are completed in a timely way. In a High Court judgment (Nottingham City Council v LW & Ors  EWHC 11(Fam) (19 February 2016)) Keehan J set out a series of good practice steps with respect to public law proceedings regarding pre-birth and newly born children and particularly where children's Social care services are aware at a relatively early stage of the pregnancy. There is a local protocol on responding to concerns about unborn children in the Localised Content for Dudley section of the West Midlands Safeguarding Procedures. The assessment plan must set out timescales for the actions to be taken, which should include regular points to review progress. Where delays or obstacles occur these must be identified and addressed, and the assessment plan must be reviewed if the child's circumstances change significantly. 'Working Together to Safeguard Children' reminds all professionals of the importance of reviewing progress and that a high quality assessment is one in which evidence is built and revised throughout the process and takes account of family history and the child's experience of cumulative abuse. A social worker may arrive at a judgement early in the case but this may need to be revised as the case progresses and further information comes to light. It is a characteristic of skilled practice that social workers revisit their assumptions in the light of new evidence and take action to revise their decisions in the best interests of the individual child. Decision points and review points involving the child and family and relevant practitioners should be used to keep the assessment on track. This is to ensure that help is given in a timely and appropriate way and that the impact of this help is analysed and evaluated in terms of the improved outcomes and welfare of the child. If the child has any sort of disability or additional needs, in recording the assessment the social worker should complete the questionnaire attached to Practice Briefing Note 0006. This will be found in the Children's Services Procedures Manual under Dudley Practice Guidance: Best Practice. "Assessment should be a dynamic process, which analyses and responds to the changing nature and level of need and/or risk faced by the child from within and outside their family. It is important that the impact of what is happening to a child is clearly identified and that information is gathered, recorded and checked systematically, and discussed with the child and their parents/carers where appropriate." See also: Working with foreign authorities: child protection cases and care orders Departmental advice for local authorities, social workers, service managers and children's services lawyers (July 2014) and The International Child Abduction and Contact Unit.